We welcome back Bernard Hoskin as out first guest in our new home, the Shirley Social Club, 135 Marshall Lake Road, Solihull B90 4RB, right next to Next at the Solihull Retail Park. Bernard left us wanting more after his last visit so we couldn’t wait to book him again. Bernard a singer, songwriter and multi-instrumentalist based near Cambridge. 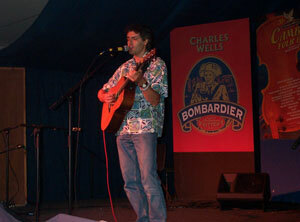 He has been performing both solo and in various groups at folk clubs and festivals in England for fifteen years. His work has been influenced by a diverse range of artists including, Paul Simon, Bert Jansch, Marc Cohn, Shawn Colvin, Papa Wemba as well as English and Celtic traditional music. Two song slots for everyone else. Doors open at 7.45 for a 8 o’clock start. Doors open at 7.45pm for a 8 o’clock start.